Hi all, lately I've been doing a lot of research about this whole man made global warming thing. Personally, to me the whole thing is a load of steaming crap made using old, manipulated data to prove a theory which is false. I've researched, read scientific papers and such. Here we can have a nice friendly debate on ether side of the argument. For any statement you enter as fact or truth, please include a link, or some other way to back it up. I could never say I'm not unbiased, and I will be arguing for the "against" side. Is my computer smarter than me ? It claims that the current Global Warming is unprecedently fast and steep for at least the last 600,000 years. This phenomenon is explained by the known factors that drive climate, and one of those factors is the forcing of additional CO2 into atmosphere by human activity. As both the fast increase in temperatures and human activity forcing CO2 are unprecedented, a causation relation is suspected. 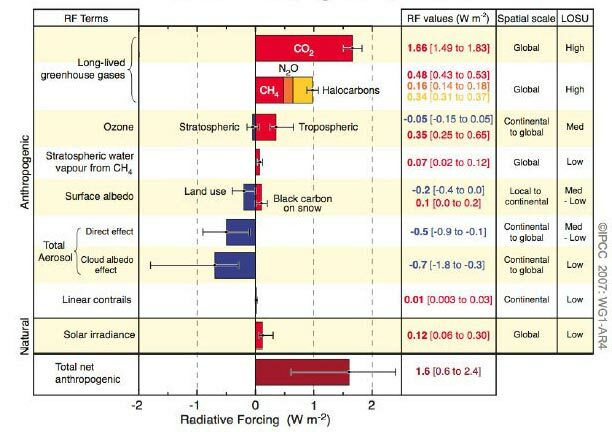 This causation is confirmed by studies on the impact of atmospheric CO2 on climate, and studies on the impact of human activity on atmospheric CO2. ok, done, no movies at all. But, to stick to true scientific facts would mean having a reliable source of them. Personally, I don't think there is a single source of facts that is totally unbiased. The IPCC report (the 600 page actual report) seems to be unbiased, but the summary and conclusion pull the same facts from the report to support the Anthropogenic Global Warming theory. While doing this they ignore almost glaring facts that put the whole theory out of whack. But the point is, only real scientists who care about the whole issue bother to read the whole report. And most of the media doesn't bother to do that, so they all see the "its man-made CO2 doing this!!" on the front. A list of these almost glaring facts might be a good starting point for a discussion. Ok, well, first was have the fact that in every ice core sample that's been taken, the rise in CO2 in the atmosphere lags behind the temperature by about 600-800 years. Also, if the current warming were caused by greenhouse gasses, logic states that the warming would be greatest in the troposphere. Weather balloon measurements say thats not true, the ground has been warming faster. Scientists have used sun-spot measurements from the last 1000 years and found that it correlates with the temperature. So, you see that giant ball of fire in the sky. yeah. That one. In my personal opinion, that thing, and our natural cycles, are the only things that drive our global climate. Also, I'd like to say that I think cutting down our...well...CO2 emissions would be a good thing to do. Not because of global warming, but because we're fast depleting our energy reserves, then what when they run out? If we speed up the rate of renewable energy sources being constructed, and startbuilding homes with solar-panel roofs, wind turbines and an electrolysis machine to separate hydrogen from water with excess electricity and store it for use on a cloudy/windless day. Thats what needs to be done so we can continue living this lifestyle we are so used to. has anyone wondered why for a change it's the experts that are anxious and the general public complacent, while e.g. for nuclear energy it's the other way around ? Quite true, in fact. The chicken also comes before the egg. The studies which secondary sources generally cite also mention CO2 provides a positive feedback mechansim, thereby contributing to further warming. Two different issues, but both relevant to today- Milankovitch cycles generally push the initial changes required to move us in glacial-interglacial cycles, and it is well known that warmer SST's hold less CO2, colder SST's hold more CO2, so as you move to a warmer period more CO2 is released into the atmosphere. Now the denialist blogosphere can say "well it lags!" all they want, but it still acts as a greenhouse gas once it is released and amplifies the warming situation. Actually, this logic would apply to any warming mechanism, not just GHG's. If there were real disrepancies it would hint at problems with observational measurements, or our understanding of moist convection (mainly in the tropics which follows the moist adiabat). The real atmospheric "signature" of GHG's is stratosphere cooling, which doesn't happen with more solar, and this is what is now observed. However, please see IPCC 2007 or the U.S. Climate Science Program link at http://www.climatescience.gov/Librar...rt/default.htm and you'll note that it looks like the troposphere is warming up a bit quicker than the surface now, although the error bars still overlap such that there is still a possibility to the contrary. You are also falling into misunderstanding #2 that I outlined in my blog at http://chriscolose.wordpress.com/200...lobal-warming/ . The CO2-warming relationship is rather basic physics, just as easy as saying that pumping out more solar activity should cause warming. So, even if the sun was getting hotter the only thing more CO2 could do is make it still hotter; you can't just pick which forcing mechanism you like and say "that is causing it, but not that one." Add them all up.